Homelegance Dresser and Mirror Bleeker EL2112-56. 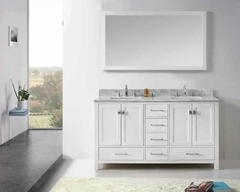 The Bleeker dresser and mirror allows for functional placement in many bedroom settings. The coordinating beds are where your personal design preferences are allowed the creativity to create your own look - the framed headboard of the wood bed features a stylish brown-grey toned fabric, while the padded dark brown bi-cast vinyl bed lends itself to a more contemporay look. Faux marble immediately draws your eye to the linear design of the brown cherry finished case pieces - the rich tones perfectly accented by uniquely designed burnished hardware. 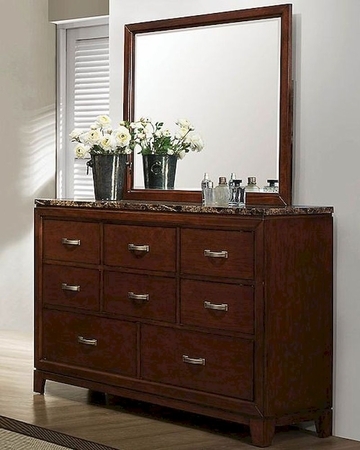 Dresser - 55.5"W x 15.75"D x 37.75"H.
Mirror - 39.25"W x 1"D x 34.5"H.